Dogs will yip, they’ll yap, they’ll jump for joy with Orange Zanies® Neon Yelpers around! Plush dog toy with squeaker. Every Yelper needs his own Yelper Dog Toy, right? Choose the size to best suit your pup! Available in a 5" length for puppies and smaller breeds and 7" for medium to larger breeds. 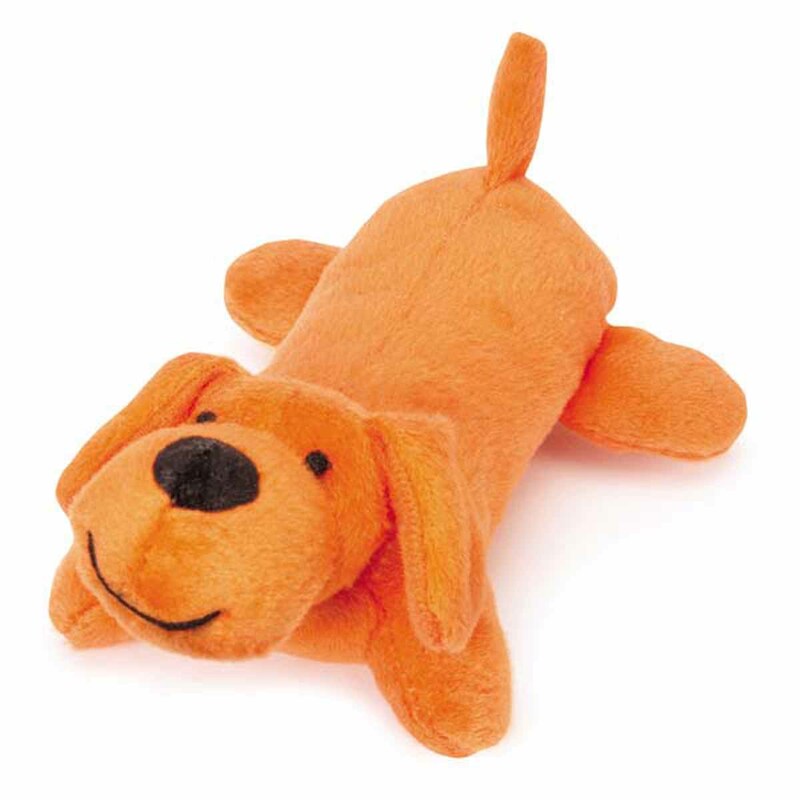 This dog plush toy is perfect for tossing for a game of fetch. The many appendages that this little dog has means you have a pretty good chance of finding a drier spot to handle for the toss! This plush stuffed animal dog toy is perfect for puppies and dogs who need a comfortable cuddle buddy to play with, sleep with, and even chew a little. While it's not a toy for heavy chewers, it does feature a pleasing squeaker to entertain your pup. This bright orange is great for Halloween. It's also is a cheery color to include in a doggie Easter basket or new puppy gift pack, but it will be a favorite year round and for dogs of all ages! What a cute little plush dog toy for your pup to enjoy for hours on end! Zanies Neon Yelpers Dog Toy - Orange Customer Photos - Send us your photo! Nelson loves playing with his new dog toy !!! Reagan won't let go of her new toy!! Hermann is a very cute and friendly rabbit. We love to take photos with him to special themes. On this photo we had the theme "Rock am Ring" a very great and famous festival in our country. Posted On 10/16/18 by Korena S from King City, OR Yes, Korena S recommends this product! I didn’t realize it would be so small. Luckily my dog does well with small toys as long as they squeak so she is loving it. Posted On 09/09/17 by Joyce C from New York, NY Yes, Joyce C recommends this product! We keep purchasing these for Maxie and he guards, protects and loves them. When washed they look like new and they are the right size for a chihuahua. Maxie knows where I keep the new Zanies and runs in circles when he receives new Zanies! Posted On 05/23/17 by Joyce C from New York, NY Yes, Joyce C recommends this product! My Chihuahua, Maxie, chose "Zanies Neon Yelpers" as his favorite toy in the whole wide world. He has it in all different colors and only plays with this toy. He passes all the other toys and heads right for the Zanies. Posted On 02/08/17 by Joan K from Lakewood, OH Yes, Joan K recommends this product! 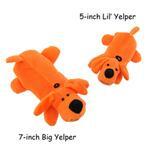 The bright neon colors of these Little Yelpers stuffed squeaky toys are perfect for small dogs! Posted On 11/01/16 by Phyllis W from Philadelphia, PA Yes, Phyllis W recommends this product! Posted On 10/25/16 by Elizabeth N from Penfield, NY Yes, Elizabeth N recommends this product! This is a great toy for small dogs. It's very soft and has a great squeak. I love the orange color too. My Toy poodle really like his new toy. Perfect size for small dogs and cats! Posted On 10/15/16 by Janis S from Baltimore, MD Yes, Janis S recommends this product! Both my cat and dog enjoy playing with this toy! They each have to have their own so we don't have any bickering! Perfect toy for both cats and dogs! I bought two of these and both my cat and dog enjoy playing with them! Great size for both small dogs and cats! Posted On 10/14/16 by lynne s from East Moriches, NY Yes, lynne s recommends this product! Not For Chewers, However my little Havanese loves to fetch this little orange pup. She runs back & forth all day with it. Posted On 10/13/16 by sonya j from Clinton Township , MI Yes, sonya j recommends this product! My dog loves this toys. He has a hard time choosing to play with it or his ball which was his all time favorite. He even took it with him to the groomer to keep him occupied. Posted On 10/13/16 by patrice s from chattanooga, TN Yes, patrice s recommends this product! Reagan grabbed it out of my hands when I pulled it out of the box. She refused to let it go and even slept with it that night! Posted On 10/12/16 by Lauren from , VA Yes, Lauren recommends this product! Such a cute little free gift. My pups love squeaky toys, even though they destroy them rather quickly! Posted On 09/17/16 by Dee from Stillwater, MN Yes, Dee recommends this product! I received my order promptly and it was well-packaged. One thing I ordered was the Zanies Neon Yelpers Dog Toy. I ordered an orange one. Toy is soft, but sturdy. Color was just as advertised; a nice vivid orange. Contains a squeaker that my dog loves, not too loud either. I got the smaller size, which is just right for my small- and medium-sized dogs. Only had toy for a few days, but it seems durable enough to last and destined to be one of my dogs' favorites. Posted On 07/05/16 by Marina from plano, TX Yes, Marina recommends this product! Super cute, soft, washable and cuddle-proven. One of our pups faves! Posted On 03/17/16 by Sandee L from Bullhead City, AZ Yes, Sandee L recommends this product! Posted On 10/10/15 by goose from Sautee Nacoochee, GA Yes, goose recommends this product! Love these lil' yelpers and so do the pups! Posted On 07/28/15 by John R from Newport news, VA Yes, John R recommends this product! This is my dog Oliver's all time favorite toy. They hold up really well with tug of war and are great quality. We own just about every color. I purchased some tank tops and an ID tag from BaxterBoo recently and my baby Snowball absolutely loves them! I will definitely be using BaxterBoo as my regular fur baby's store!